WACO, TX - Waco Police and ambulance units were sent to the 2800 block of Summer Avenue on Monday morning. Police set up a perimeter in the area with several units, including a K-9 unit dispatched to the area. 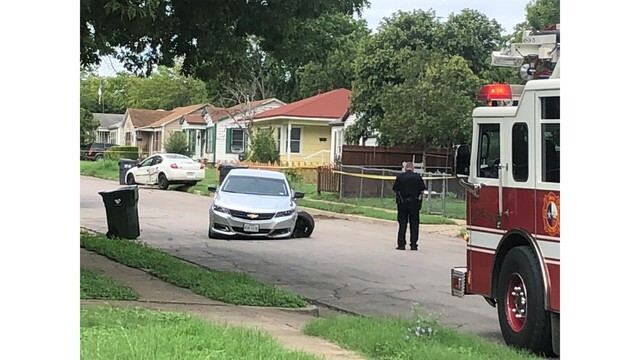 Police say two vehicles collided at 29 th and Summer about 9:50 a.m. with a gun battle ensuing between people at the scene. Police spokesman Sgt. Patrick Swanton said that it has not been determined if one of the cars was parked and was run into. Swanton said that it was not known exactly how many shots were fired, but said it was "several". One stray round struck a nearby house, but no one was injured and Swanton said the house itself had not been targeted. One man was wounded and was found near the scene. He was transported to a local hospital, and while his exact condition was not known, he was reported to have been conscious when transported. Two other men fled the scene, and while police set up a perimeter and brought a K-9 to the location to help in the search, they have not been found. Police were interviewing witnesses throughout the area through the morning. Police say that the two men who fled the scene should be considered armed and dangerous. They were described only as men between 19 and 25 years old. The identity of the wounded man was not released. Fox 44 spoke with Tanisha Hall whose house was hit by at least one bullet. She has been renting this home for five years. Hall says she is glad she and her children were not at home when this happened. She has no plans of moving out as she says she truly loves her community. However, she says, "I would hate to lose one of my children over nonsense. It is disgusting that I can't go in my own house because of tragedy." Officers say they discovered multiple shell casings and a handgun. Hall says, "It is really devastating for this neighborhood cause we never have any issues over here." Swanton says, "Bullets don't have names on them folks and just because you are shooting at somebody you are mad about - it could have easily gone through the home and into another human being." The Waco mother has a message for those putting her and her family in danger, "You gotta do better in life, don't let stuff like this ruin your communities." As of Monday afternoon there has been no update from police about the men's whereabouts.